Elementary school children who have evacuated from Okuma-machi to Aizu Wakamatsu City tried cookie making on August 13. Okuma-machi is where Fukushima I Nuclear Power Plant is located. The children used dried peaches and persimmons that are made in Fukushima. Kunio Tokuoka (age 51), the executive chef at "Kyoto Kitcho", 3-star restaurant in the Michelin Guide, advised the children on the recipe. [Kyoto Kitcho?] plans to commercialize the cookies and will ask other 3-star restaurant chefs in the world for help in selling the cookies. [Tokuoka says he] wants to portray the true image of Fukushima to the world as a rich agricultural land, and not as Fukushima of the nuclear power plant accident. The sales pitch is "the world's safest cookies" made from food items that have passed the test for radioactive materials. If passing the test means testing for less than the provisional safety limit, that doesn't seem very safe to me, but it's just me. By the way, radioactive cesium exceeding the provisional safety limit (500 becquerels/kg) has already been found in the wheat grown in Hirono-machi in Fukushima. Minami Soma City, while waiting for the lifting of the "evacuation-ready zone" designation, tested the internal radiation exposure of the residents in the high-radiation area within the city using the whole body counter. Over 1 millisievert internal radiation was found in a man in his 60's, but the rest of the residents tested less than 1 millisievert, and the mayor of the city is pleased with the result. Minami Soma City in Fukushima Prefecture tested the internal radiation exposure of the city's residents, and found one man in his 60's with more than 1 millisievert radiation. The result was announced by the City General Hospital on August 13. It is the first time that internal radiation of more than 1 millisievert has been detected in the survey of the city residents. The whole body counter was used to evaluate the radiation exposure in the future from the ingested radionuclides such as radioactive cesium. Half life of cesium-137 in the body, taking into account the amount that will be expelled in urine and stools, is 9 days for children aged between 0 and 1, 89 days for people over 31. At this point, the amount of radioactive materials in the body is considered to have decreased significantly. The survey was done on 569 people over the age of 16 who live in a high-radiation area in the city and 330 students aged between 6 and 15, who attended the elementary schools and junior high schools in the city at the time of the accident. According to the hospital, the man who has been found with 1.02 millisievert internal radiation stayed in the mountain on March 12 to secure water supply. Mayor Katsunobu Sakurai said "It is regrettable that one resident exceeded 1 millisievert. But the vast majority of the residents tested at the safe level. I believe the residents of the city can judge from the result that the city is safe to live and work." There was no one exceeded 20 millisieverts, the level at which a treatment may become necessary. 561 adults, 99% of the subjects, tested less than 0.5 millisievert; 7 adults tested between 0.5 and 1 millisievert (not exceeding 1 millisievert); 2 school children was found with radioactive cesium, but the rest tested below the detection limit. First, the Japanese government who is losing credibility by the day, if not by the hour, among the Japanese population and the world at large over its (non-)handling of the nuclear and radiation crisis. The Ministry of Education and Science has just created a new booklet for elementary schools, junior high schools, and high schools to be used in the new semester starting in September to teach children about "radiation", and what to do in a nuclear disaster like the one they've been having since March 11. To teach them to pay close attention to the announcements by the national government and municipal governments in the event of a nuclear accident and evacuate accordingly. About the last point, many people did just that. They followed the government instruction on evacuation and ended up going where the radioactive plume went - north and northwest, then change direction and headed south from there. The government instruction, assisted by the nuclear experts back in March, was to go as far away from the plant, in any direction, as the strength of radiation decreases with the distance. What they forgot to tell the populace is that it was not a nuclear bomb that exploded in a flash but a broken nuclear reactor releasing a tremendous amount of radioactive nuclides in a plume. Anecdotes of children from Fukushima being bullied were reported back in April and May, and the media made much of them. Whether they were true or another "baseless rumor" from the government, I do not know. The booklet continues the government's position to confuse "radiation" with "radioactive nuclides", making it appear as if radioactive nuclides that exist in nature are no different from the man-made radioactive nuclides. (That will be another post.) I'm pretty positive that the booklet will have the illustration of the different level of radiation from different sources, rendering everything into numbers in microsievert and millisievert. Cash is now a terrorist tool. Flashlight, too. Never mind that, as the linked article points out, another branch of the same government, FEMA, tells citizens to store up on flashlights and matches in a weatherproof containers and ready-to-eat foods as part of disaster preparedness. So you go to a surplus supply store to stock up on these essential disaster preparedness items as recommended by FEMA, and you may become a "terrorist" according to FBI. Catch 22. What went in did come out. First, it was Shimane Prefecture where they found the manure made from cow dungs and urine with radioactive cesium in excess of the hastily decided provisional safety limit for manure and composts (400 becquerels/kg). The level of radioactive cesium ranged from 152 to 1083 becquerels/kg. The cows had eaten radioactive hay from Miyagi Prefecture. (From Asahi Shinbun 9/11/2011, original in Japanese). Now it is Niigata Prefecture. Unlike Shimane Prefecture who just tested the manure at the JA (Japan's agricultural producer co-op) stations, Niigata also tested the manure made at individual farms (sampling), and even higher amount of radioactive cesium was detected. According to the Niigata Prefecture announcement on August 13, of the individual farms, only Niigata City and Sado City (on the island of Sado off the coast of Niigata) tested below the detection limit. Even if the manure at the individual farms tested high, the numbers at the the manure manufacturing depots were low, as the radioactive manure was mixed with non-radioactive manure. No radioactive iodine was detected anywhere. In the table above, the individual farms No. 5, 6 and 7 (radioactive cesium 260 to 1,100 becquerels/kg) are located in the same city as the manure depots No. 3 and 4 (ND to 10 becquerels/kg). The individual farms No. 3 and 4 (3,760 and 1,280 becquerels/kg) are located in the same city as the manure depot No. 2 (330 becquerels/kg). But since the numbers at the manure manufacturing depots are low enough, it will probably be sold to other farms to be used in their fields, thus spreading the low-level contamination all over Niigata. In the eyes of the government and producers, they are "safe" as long as the numbers are below the arbitrary safety limit number that the government picked after the fact. Testing by sampling one or two farms in a city will be enough for them. Niigata Prefecture has told the 9 farms whose manure exceeded this safety number (400 becquerels/kg) not to move their manure [to the depots], meaning the other farms and the farms whose manure weren't tested will continue to send their manure to the depots or use it on their farms or give it to other farmers. There's no stopping the radioactive Japan. They were going to burn it in Kyoto in the annual "Gozan no Okuribi" - ceremonial bonfire to send off the spirits of the dead at the end of Bon Festival. It was going to be burned for the people who died in the disaster-affected area, particularly in Rikuzen Takata City in Iwate Prefecture, where the firewood was made from the fallen pine trees. When the news first broke of the plan to use the firewood from Rikuzen Takata City in Iwate, 185 km north of Fukushima I Nuclear Power Plant, concerned Kyoto residents protested, fearing the spread of radioactive materials by burning the wood. The residents were roundly scolded for being selfish, uncaring, insensitive to the people who suffered so much in the earthquake/tsunami of March 11. Then, on August 10, radioactive cesium was detected, as high as 1,480 becquerels/kg, from the debris in Rikuzen Takata City. Someone decided to test the new batch of firewood that came from Rikuzen Takata City on August 11, and they turned out to be radioactive. Not much, in the current radioactive state of things in Japan, as it was "only" 1,130 becquerels/kg of radioactive cesium. Kyoto City has decided not to use the firewood after all. But the city is being scolded for overreacting and "culturally insensitive". Kyoto? Culturally insensitive? "Just when we thought we were all going to do it..." On August 12, Kyoto City decided not to burn the firewood made from the pine trees from Rikuzen Takata City in Iwate prefecture because of radioactive cesium detected from the firewood. The firewood was to be burned in the "Kyoto Gozan no Okuribi" bonfire [on August 16]. Organizers of the event in Kyoto City were disappointed and perplexed. Kyoto City Mayor Daisaku Kadokawa apologized, "I am heart-broken for having disappointed people in Rikuzen Takata City and in the disaster-affected areas. I sincerely apologize to people who have put in tremendous effort in making it happen." The mayor repeated, "there is no national safety standard for firewood. I urge the national government to create the safety standard as soon as possible." The firewood was provided by an NPO "Fukui Disaster Volunteer Net" in Sakai City in Fukui Prefecture. The head of the NPO, Misao Higashikado doesn't know what to do. He planned the proceeds from the sale of the firewood to go to the disaster relief effort, and in May his organization collected the pine trees felled in the March 11 tsunami from "Takata Matsubara", a national scenic spot, and started to sell the firewood made from the pine trees. The shipment just started in mid July. He says every piece of the firewood has been tested one by one by a simple testing, and that no radioactive materials have been detected. "I am bewildered by the turn of events. We just wanted to help the recovery in the disaster-affected area", he says. The head of this NPO, Misao Higashikado, is also an Assemblyman in the Fukui Prefectural Assembly. "Even if one ate 1 kilogram of the bark [they tested the bark] and it were all absorbed in the body, the radiation level would be negligible. It's a meaningless pursuit of cleanliness that tramples down the feelings of the people in the disaster-affected area." "'Gozan no Okuribi' is a traditional religious ceremony. I suspect the radiation was taken as uncleanliness or defilement. This is not the matter of science but of culture. It should be solved culturally, and the memorial ceremony for the deceased should be performed." Professor Anzai, radiation contamination is indeed uncleanliness, and it cannot be cleaned by spreading it all over Kyoto. The memorial ceremony for the deceased can be performed without burning the radioactive firewood over the city of Kyoto. I do not believe the deceased in the disaster-affected areas would want to spread the radiation unnecessarily. To Kyoto City, the mayor said, "It has spread the baseless rumor [that the firewood from Rikuzen Takata is radioactive - never mind it is], and that has inconvenienced people in the disaster-affected areas and residents in Kyoto City. I would have liked the city to proceed more cautiously." Here we go. Radioactive firewood is just another "baseless rumor". Half life of xenon-131m is about 12 days. The measurement of density of radioactive materials in the air inside the Reactor 2 Containment Vessel was delayed because there was water in the temporary sampling instrument that TEPCO installed outside the CV. It looks like they decided to measure the water anyway, as well as the air. According to the measurement, the air is more radioactive than the water inside the Containment Vessel, but less radioactive than the air inside the Reactor 1 CV. So the melted fuel is probably not even inside the Containment Vessel in Reactor 2 either. But what's with krypton and xenon? I also read a tweet by one of the workers at the plant who said there is still radioactive iodine being released, even though TEPCO's monitoring says iodine-131 is not detected at the plant any more. Creation of the "Special District" system for medical research has been in discussion between the national government and the Fukushima prefectural government, and the outline of the system has been revealed. It includes: loosening the regulations of the Japanese Pharmaceutical Affairs Law only in Fukushima Prefecture and thus encouraging new entrants to the medical equipment manufacturing and sales; setting up data centers for medical cases and research centers for recurrent cancer at hospitals in Fukushima, which will attract pharmaceutical companies, medical equipment companies and medical researchers to Fukushima. The government is expected to allocate 10 billion yen (US$130 million) in the 3rd supplementary budget for the fiscal 2011. 10 billion yen to set up pharmaceutical research and data collection centers so that pharmaceutical and medical equipment industries flock to Fukushima. The government is clearly looking forward to a thriving medical industry in Fukushima with abundant (slightly over 2 million) research subjects of all ages. From the above short description, it doesn't seem to be about treating people who will come down with radiation sickness. It is about collecting data and experimentation. Since the national government is fiscally broke, the money will eventually come from the Japanese taxpayers, who will be made accomplice to this human experiment in Fukushima. Dr. Shunichi "Damashita (who conned, lied, tricked, duped, take your pick)" Yamashita must be so thrilled. It looks like the NHK Special on the grassroots effort in Japan to map the radioactive fallout after Fukushima has been translated by NHK World into English. Get it while you can, until NHK takes it down..
One is a scientist, the other like a politician. One has things to say, the other has things to un-say. Tokyo Brown Tabby will put the caption as soon as Tabby figures out the captioning software glitch (anyone know of a good software compatible with the latest Youtube? Tabby's software (freeware) apparently cannot deal with the change). But in the meantime, you can view how these two specialists talk, how they look. That alone seems to speak volume on what they are. From the viewpoint of specialists in genome science, like I am, we should not modify our conclusions in the face of the reality. Specialists should tell the truth as it is, no matter how difficult it is. That's right. So, the primary responsibility of specialists, specialists in medicine like us, is to tell the public what health damages could potentially occur. It a specialist assumes from the beginning, "If I say this here, it will cause problems there", he/she is a politician, not a specialist. Responsibility of specialists manifested itself when the tsunami hit the Tohoku region. In Ishinomaki-City, specialists in disaster prevention were devastated when their disaster prevention measures had failed in the tsunami. But at the same time, they were delighted that children, whom they had taught, as part of the disaster prevention program, "When tsunami comes, run. Look around, help each other, and run to the higher ground at all cost", survived. They felt they had fulfilled their obligation as true specialists. This incident has reinforced my belief on the role of specialists: if there is a real danger, inform the public that it's really dangerous, and tell them we will pull through together. I think the fundamental reason why the Atomic Energy Society of Japan [nuclear specialists] and Japan's nuclear policy have failed is because specialists have abandoned their pride and dignity as specialists. Because they've become politicians, or businessmen, by not telling the truth to the public. Without the self-examination of this fact, I don't think the rebirth of the University of Tokyo, or of Japanese scientists, would happen. ...at the lecture by Radiation Health Risk Advisor of Fukushima. "Now that the national government has decided the safety exposure limit to be 20 millisieverts per year, we, as Japanese citizens, have an obligation to follow the government's decision." Can the safety limit of 20mSv/yr really protect our children? After the lecture, we went to him to confirm that point. "You should think of 20mSv/yr as a provisional level." [In the lecture] You said you didn't know [about the health risk under 100mSv/yr]. Does it mean you cannot say it's safe, either? "Of course I can't. That's why we are discussing where to draw the line in that gray zone." You mean you're telling the people of Fukushima to put up with it? After all, we couldn't hear the words of confirmation that he would guarantee the safety of children. What would that do? Probably it would make things worse. The Ministry of the Environment is one of the least powerful ministries with hardly any knowledge or expertise in nuclear energy or industry. Well, what about safety? How would that be promoted, by putting the Agency under a ministry that has near-zero expertise and knowledge in nuclear power? Remember also that it is the Ministry of the Environment who is very eager to raise the radiation limit of radioactive debris from 8,000 becquerels/kg to 100,000 becquerels/kg so that the debris can be burned at any facility anywhere in Japan and buried. It was decided on August 11 that a new agency, Nuclear Safety Agency (temporary name) will be set up under the Ministry of the Environment. For a very long time, the regulatory agency for nuclear power, the Nuclear and Industrial Safety Agency, has been under the Ministry of Economy, Trade and Industry which has promoted nuclear power. That awkward situation of having the regulator and the promoter of nuclear power in the same ministry will be dissolved by moving the agency to the Ministry of the Environment. However, the Ministry of the Environment is one of the smaller ministries, and it is unknown whether the ministry can exert any effective leadership in nuclear regulation. Upon hearing the decision by the Democratic Party of Japan (the ruling party), officials in the Ministry of the Environment are puzzled - "There are many here who are anti-nuke at heart", "We have hardly any experts in nuclear power". There are 1,258 personnel at the ministry, with the budget of only 200 billion yen [US$2.6 billion]. The Nuclear Safety Agency, which is to be newly created, will be staffed with 500 personnel from the METI's Nuclear and Industrial Safety Agency and the Nuclear Safety Commission under the Cabinet Office. There are those who voice concerns: "The Agency will continue to have the "Nuclear Village" mentality. It may take decades for the two organizations to effectively merge. We are afraid the balance of power within the ministry will be disturbed." The Ministry of the Environment prides itself in "acting as the opposition within the government" (according to senior officials of the ministry) in dealing with problems like pollution. However, it is not in a strong position within the government in terms of personnel and budget, and has often been forced to compromise in negotiation with the other more powerful ministries. Also, the ministry has hardly any nuclear expert as of now, and they don't have experience in emergency response during a big accident. The Mainichi article quotes a Tokyo University professor (in government administration) who says the Ministry of the Environment is not really detached from the nuclear power interest groups, because it has promoted the nuclear power as environmentally friendly, clean energy to counter the "global warming". (Update) It's unreal. The commission members continue the meeting, totally ignoring the questions from the audience who want Tomari Nuke Plant stopped and inspected properly. At one point, the commission head, Haruki "Detarame" Madarame declared the meeting over. It looks like something very unusual is happening. There are a lot of people attending the Nuclear Safety Commission's meeting on August 11 which is open to public, and they are shouting at the commissioners. The NSC is discussing the nuclear power plant maintenance schedule. Why is it an issue that attract so many people? It's because of one nuclear power plant in Hokkaido that has been "testing" the reactor for over 5 months after the regular maintenance was over. Even though the "testing" is done on a full, commercial scale, Hokkaido Electric Power who owns the plant, Tomari Nuclear Power Plant, is calling it "testing" so that they can continue to generate power without going through the so-called "stress test". The NSC meeting today is supposed to endorse the re-start of "commercial" operation of the reactor without the stress test, and that's what people who fill the room are upset about. But shouting down the commissioners? And apparently the commissioners don't even try to rein in the crowd, as one reporter tweets "guilty conscience, maybe?" and want to bring clean water and vegetables as souvenir for their parents after the summer camp. Our fun-filled summer camp was finally over. We all cried at parting, because they didn't want to go back, and we didn't want them to go back to Fukushima under the current situation. Many Fukushima children were collecting empty plastic bottles. They said they wanted to fill the bottles with clean, safe water that they drank at the camp and bring them to their parents. The bus arrived at the temple [where the camp was held] to take the children back to Fukushima. We asked them, "Where would you like to go to buy souvenirs?" They answered "Please take us where we can buy locally-grown vegetables, not supermarkets." Safe vegetables for their families. The last day of the camp. A child from Tokyo said to a child from Fukushima, "Now it's my turn to visit you in Fukushima!" The child from Fukushima suddenly looked serious and said "You'd better not come to Fukushima right now." How could this be allowed? These children went back to the very place they just told others not to go. when the Ministry of the Environment decides on the base plan after it runs the plan with the so-called experts that the ministry relies on (i.e. rubber-stamp). Great leap forward in recovery and reconstruction. On August 10, the Ministry of the Environment made public the base plan for the ashes from burning the debris and sludge that contain radioactive materials from the Fukushima I Nuclear Power Plant accident. The plan would technically allow all the ashes to be buried. The plan was given on the same day to the ministry's committee of experts to evaluate the safety of disaster debris disposal, and the ministry hopes to finalize the plan before the end of August. In June, the ministry announced that the ashes that test up to 8,000 becquerels/kg of radioactive cesium can be buried in the final disposal facilities. It called for the temporary storage of the ashes that exceed 8,000 becquerels/kg but didn't specify the final disposal procedure. In the base plan announced on August 10, to bury the ashes whose radioactive cesium exceeds 8,000 becquerels/kg, some measures need to be taken to prevent radioactive cesium from making contact with ground water, or to process the runoff appropriately. For the ashes that measure 8,000 to 100,000 becquerels/kg, the plan calls for: 1) processing facilities with roofs; 2) durable containers; 3) mixing the ashes with cement to solidify. The whole plan is moot, because, on the side, the ministry has already told municipalities that they can "mix and match" - burn radioactive debris and sludge with non-radioactive debris and sludge to lower the radiation below whatever the limit the ministry sets, which has been 8,000 becquerels/kg and now 100,000 becquerels/kg if the plan gets an approval from the expert committee. The ministry set the limit for Fukushima Prefecture, then notified other prefectures to "refer to the Ministry's instruction to Fukushima Prefecture and notify the municipalities accordingly". The Ministry of the Environment, which is likely to be selected as the new regulatory authority over the nuclear industry in Japan, is not very known for timely disclosure of information online. This base plan, if it is announced on their site, is buried so well that I can't find it. The latest information on the earthquake/tsunami disaster debris is dated July 28, which specified the "temporary" storage of the ashes that exceed 8,000 becquerels/kg of radioactive cesium. It looks like the ministry is simply making this "temporary" storage into permanent. Expertise to deal with anything radioactive is non-existent at this ministry. Good luck Japan. The work to cover up the reactor building of Reactor 1 at Fukushima I Nuke Plant has started. Take a peek at TEPCO's live cam. A huge crane next to Reactor 1. The work seems to be over for the day. They stop working at 2PM at the plant due to heat. The insider rumor says TEPCO/the government really don't want those pesky satellites to look down on their broken reactors. They don't want to see them on Google Earth..
Having the workers run past the super-hot 10-plus sieverts/hr exhaust stack and hurry up the 2nd floor with 5-plus sieverts/hr radiation, TEPCO has managed to install a heat exchanger for the Spent Fuel Pool of Reactor 1 to cool the pool steadily. One of the workers who installed the heat exchanger there tweeted that he got 10 milisieverts of radiation exposure for the several days of work. No one knows how hot the pool has been anyway because the instrument is broken since the earthquake on March 11, but TEPCO says the heat exchanger will cool the water to the same level as the water in Reactors 2, 3, and 4. It's called "keishiki" in Japanese. In English, it's "formality". Cooling the reactors that are likely devoid of melted fuel and injecting nitrogen gas, and cooling the SFP without knowing how hot it is are all part of the "formality" or checklist that TEPCO submit to the government, so the government can support its claim of safety and stability of the situation at Fukushima and tell the residents to go home. TEPCO started the heat exchanger for the Spent Fuel Pool in Reactor 1 on August 10 morning to cool the water in the SFP steadily. The heat exchangers for the SFPs in Reactors 2, 3 and 4 are already operational. Steady cooling of the SFP is scheduled to be accomplished in January 2012 in the "roadmap", but TEPCO will succeed in achieving that goal much earlier [if the Reactor 1 SFP heat exchanger works as planned]. According to TEPCO, there are 392 fuel rod clusters in the Reactor 1 SFP. The temperature of the water hasn't been measured because the instrument is broken, but the water has been injected on a regular basis. TEPCO doesn't think the temperature is very high, and with the heat exchanger it will be brought down to 30 to 40 degrees Celsius, the same level as that of Reactors 2, 3 and 4. On the side note, Goshi Hosono, PM Kan's assistant and the minister in charge of investigating the Fukushima nuclear accident, will also be in charge of the new organization to support electric power companies to pay damages in nuclear accidents. The law to create the organization passed both Houses in the Diet. Conflict of interest, Mr. Hosono? It's all about money. The national and prefectural governments don't want to spend on the residents, decontamination, compensation. So what do they do? They return the residents to their high-radiation homes and schools by telling them Fukushima I Nuclear Power Plant is broken in a stable way, so carry on with your lives and stay there. To pave way for the lifting of the "emergency evacuation-ready zone" designation in Fukushima Prefecture, the Nuclear Disaster Countermeasures Headquarters announced the result (provisional) of the survey of the air radiation levels in 1,424 locations in the 5 municipalities in the zone. The survey was done in schools, on commute routes to schools and in other public facilities. The highest and lowest readings were both in Minami Soma City, 5.5 microsieverts/hr and 0.1 microsievert/hr respectively. The house that measured 5.5 microsieverts/hr radiation has already been designated as "specific evacuation recommendation spot". According to the government, if the radiation level exceeds 3 microsieverts/hour, the annual cumulative radiation exposure may exceed 20 millisieverts, the number that the government pays close attention to as it will require thorough decontamination of radioactive materials. That will be on top of added internal radiation and natural radiation exposure (which in Japan is 1.5 millisievert/year). What's more unconscionable than returning the residents to these municipalities is that the governments, both national and Fukushima, never bothered to evacuate people, not even warn them, in higher radiation areas much further away from the plant, like Fukushima City, Date City, Koriyama City, and many more. They are 50 to 60 kilometers from the plant, and everyone was told their city was safe because it was so far away from the plant. What the government didn't bother to tell them was that it was not an atomic bomb explosion where distance may have mattered, but it was a nuclear power plant explosion where weather played a much greater role than the distance. But from early on, the government must have known that those distant cities were in big trouble. Recall that it was to Fukushima City first, that Dr. Shunichi "100 millisieverts are safe" Yamashita was dispatched on his very first assignment as Fukushima Prefecture radiation risk management advisor on March 21, one day after he was appointed. But what was he instructed to do? We all know now that he was sent to tell everyone in those cities it was safe, nothing to worry about. Proud descendant of Byakko-tai, he addressed the Fukushima City residents. As if it were their noble duty to die, fighting the invisible radiation. The Japanese government has become so much alike the government in the US, where they try to accomplish the task of governing by talking. A sign of a bankrupt government, both fiscally and morally. Oh, and to make sure the residents who are not well-to-do have no choice but to come back, the Fukushima prefectural government has been closing the official evacuation shelters and cutting off the subsidies to the residents who fled to other prefectures, now that the nuke plant is "stable". And the US stock market goes all over the place. Dow was -60, but a mere second ago it had been -90. Then it was -60, and now +58. I believe the order is out to the traders and algo bots: "Don't you dare let the market end up in red." Occasionally my stock screen that has companies in different industries lights up all at the same time in green, except for those inverse ETFs, which indicates to me that they are buying up the indices (or futures on it or options on the futures or options on double- and triple-long ETFs on indices...). Three Fed FOMC members (Richard Fisher, president of the Dallas Fed, Charles Plosser of Philadelphia and Narayana Kocherlakota of the Minneapolis Fed) dissented, who wanted to keep the rate low for "an extended period" without mentioning the time frame. at a record low at least through mid-2013 in a bid to revive the flagging recovery after a worldwide stock rout. The vote was 7-3. Richard Fisher, president of the Dallas Fed, Charles Plosser of Philadelphia and Narayana Kocherlakota of the Minneapolis Fed all dissented. It was the first time under Bernanke that three FOMC members dissented. Remember the Naraha-machi mayor who wanted to re-start Fukushima II Nuclear Power Plant as soon as possible and have the final reprocessing plant in his town as the "post-nuke" plan for the town? It seems like he's getting his wish. As soon as the national government receives plans from the municipalities on how they will re-open the public services in their towns, that will be good enough for the government to lift the designation of the "emergency evacuation-ready zone" and have all the residents back to their homes. Never, ever mind that the area's radiation level is anywhere near safe not just for children and young mothers but for anyone. The Nuclear Disaster Countermeasures Headquarters (headed by Prime Minister Kan) held a meeting on August 9 and decided to lift the "emergency evacuation-ready zone" designation all at once. It will be done when the municipalities in the designated zone submit their recovery plans, which are expected sometime between later this month and the early September. The "emergency evacuation-ready zone" has been set in areas outside 20-kilometer radius from Fukushima I Nuclear Power Plant, and includes 5 municipalities - Minami Soma City, Tamura City, Hirono-machi, Naraha-machi, and Kawauchi-mura. The residents in the "emergency evacuation-ready zone" in these municipalities are to be ready to evacuate in a nuclear emergency, and they have been encouraged to voluntarily evacuate children. According to the Nuclear Disaster Countermeasures Headquarters, the 5 municipalities are to submit the recovery plans to the government by early September at the latest with details on when the schools and medical facilities in their municipalities will re-open. As soon as the government receives the plans, it will lift the "emergency evacuation-ready zone" designation and let the residents return. During the meeting, Prime Minister Kan instructed the ministries and agencies involved to cooperate closely to assist the residents in returning from evacuation. Germany's ZDF Television is here. Said 35,000 becquerels/kg [of radioactive cesium, most likely] has been found in the soil of a rice paddy planted with rice, and asked if the government does any thorough check. Hosono [minister in charge of the nuclear accident] consulted with his staff for a very long time, and said they will confirm the number. He said the government will check the rice as they grow in the rice paddies. Trading halted for 20 minutes on Kospi. That means it has dropped 10%. The Korean central bank is stepping in. It feels like a total panic in Asia. Hang Seng down 1,500 points. The consumer price rose by 6.5% in July in China, highest percentage rise in more than three years. In other words, a bad number for the market. Riots spread all over the country in the UK. Gold hit US$1,745, and hitting all-time high in other currencies. 1 ounce of gold is 1,225 euro, 134,536 Japanese yen, AU$1,736, 1,067 British pound. It may continue, as my personal contra-indicator (a certain financial network owned by GE) is still trying to spin it positively and bottom-pick. Someone said Bank of America is a buy here. Minami Soma City Embarks on Decontamination on its Own, But Where Will The Radioactive Dirt Go? Minami Soma City, where the mayor of the town went on Youtube a few days after the March 11 earthquake and pleaded for food and water, has started to decontaminate the city on its own without the national or prefectural government assistance. On August 8, Minami Soma City in Fukushima Prefecture started the decontamination effort to remove radioactive materials released from the Fukushima I Nuclear Power Plant accident. The decontamination will be carried out city-wide except for the no-entry zone. The decontamination work started on August 8 at Kashima Elementary School in Kashima district of the city. The goal of the city-wide decontamination is to lower the radiation level in anticipation for the elimination of the emergency evacuation-ready zone. The surface soil of the school yards at elementary and junior high schools and kindergartens will be removed, and the walls and the roofs of the school buildings will be washed, using the pressure washers. At Kashima Elementary School, a construction company in the city started to remove about 5 centimeters of the surface soil in the school yard, using 3 power shovels. The removed soil will be buried in a hole that has been dug in the yard. The city has allocated 900 million yen (US$11.6 million/8.17 million euro) in the supplementary budget for this fiscal year, and designated August and September as "Decontamination month". By the end of September, the city plans to carry out decontamination at all 35 public elementary and junior high schools, kindergartens, nursery schools, and children's centers except for those located inside the no-entry zone. Minami Soma City has everything - planned evacuation zone, emergency evacuation-ready zone (these two are about to be phased out), no-entry zone. The city has already send the notice to residents who have evacuated from the city to return. First, where will the radioactive dirt and sludge go? If Fukushima City is any indication, it will be "temporarily" buried in somebody's backyard without that somebody being notified. Burying in the hole in the school yard cannot be the permanent solution. Second, how low will the radiation go? Again, if Fukushima City's result, and Minami Soma's very own result, is any indication, the radiation may go down by half. But then what? Having the air radiation level from 2 microsieverts/hour to 1 microsieverts/hour for example may be great on paper, but it is far from the level Minami Soma residents with small children should feel safe returning to the city. Third, as Professor Kodama said, to turn radiation contamination in one number - air radiation in microsievert/hour - misses the real picture of contamination. Iodine goes to thyroid, cesium goes to bladder, strontium goes to the bone. Even for the internal radiation, the effective dose for the entire body may not mean much. And lastly, who is going to train the ordinary residents into part-time radiation workers? Professor Kodama's Radioisotope Center is supposedly helping Minami Soma City, but if you look at the decontamination manual issued by Minami Soma, it is no different than what Fukushima Prefecture has issued for residents. Not much protection beyond masks and gloves to deal with radiation. Without the bigger, systematic plan that includes the final processing and disposal of radioactive materials, any decontamination effort may simply displace radiation from one place to another. Ouch. Following Asia and Europe, Dow down 541 points, S&P down 68 points, Nasdaq down 142 points. Gold was as high as $1,721 earlier, now pushed back down slightly to $1,715. On Tuesday, the Fed will start the 2-day FOMC meeting. And PPT to the rescue... Dow down only 365 points, 40 minutes left to trade. TEPCO hopes to have a "cold shutdown" where the temperature at the bottom of the RPV is low [below 100 degrees Celsius] as the target for winding down the nuclear accident. But if the fuel core is mostly melted and has dropped down to the Containment Vessel, it may affect the "roadmap". No kidding. Yes it may. Where have you been, Asahi, for all these months? Is this news to you? 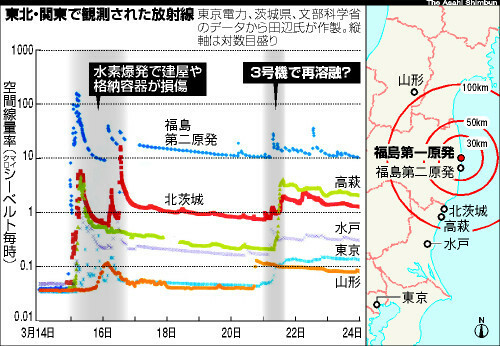 Tanabe's chart (from Asahi article) plotting the air radiation level (in microsieverts/hour) shows a spike on March 21. It rained that day in Tokyo. The pump for the chemicals for the treatment for the contaminated water stopped in the French-made system [AREVA] stopped at 8AM on August 7. The backup pump failed to start, and the entire treatment system shut down. According to TEPCO, the viscosity of the chemicals were too strong, putting too much pressure on the pump. TEPCO adjusted the flow of the chemicals and restarted the pump at 3:30PM. The reason why the backup pump didn't work is still unknown. And Kurion's pumps are still offline, according to NHK. With Toshiba's SARRY not even in the test run yet and Kurion offline, the contaminated water treatment is done by Toshiba's oil separation unit - AREVA's co-precipitation decontamination unit - Hitachi's desalination by reverse osmosis - AREVA and Toshiba's evaporative concentration unit (new). Decontamination is totally dependent on AREVA's unit for now. Snippets that I pick up from Twitter and some Japanese magazine articles interviewing anonymous high-level managers at Fukushima I Nuke Plant indicate that the workers have almost given up on having Kurion and AREVA units run without frequent problems, and are pinning their hope on Toshiba's SARRY. But they do say they are impressed with AREVA's unit's ability to decontaminate. When it is working, that is. Japan is the birthplace of the candlestick chart analysis that the market technicians worldwide use. The candlestick patterns were first devised in Japan and used for rice futures trading in Osaka in the 18th century Japan, or so the legends say. The rice futures trading was stopped during the World War II as the government rationed the rice supply, and the government control of distribution of rice continued after the war until 2004. Now that the rice market is more or less "free" (the government is still heavily involved in growing the rice), Japan decided to re-open the rice futures market for the first time in 72 years, and Monday August 8 was the first day of trading. The rice futures started trading on the Tokyo Grain Exchange and the Kansai Commodities Exchange, but trading was almost immediately halted at the Tokyo Grains Exchange as traders bid too high, and the limit up circuit breaker was triggered. Japan's rice futures market is the one and only market in the world that deals exclusively with short-grain rice. From the photo (from Yomiuri; Kansai Commodity Exchange), it looks like the pit trading, not the electronic one. Like good old days 300 years ago. Or it could be just an enactment of good old days. The rice futures started trading on August 8 for the first time in 72 years at the Tokyo Grain Exchange and the Kansai Commodity Exchange. At the Tokyo Grain Exchange, buyers bid up the price of rice futures with the expectation that the price of rice will rise due to the Fukushima I Nuclear Power Plant accident. As of 1PM, no transaction has been settled. The officials at the Exchange say, "The supply concern due to radiation contamination is more wide-spread among traders than we thought." The Tokyo Grain Exchange started the trade of 4 to 6-month futures on "Koshihikari" rice grown in the Kanto region, but the buy orders vastly in excess of the equilibrium contract price of 13,500 yen per 60 kilograms flooded the market. The Exchange has set the limit on price movement at 600 yen, but the trading has been temporarily suspended as it triggered a circuit breaker . No transaction has yet to be settled. According to Nikkei Shinbun, traders on the Tokyo Grain Exchange thought the equilibrium contract price indicated by the Exchange was too low, and they bid as high as 18,500 yen/60 kilograms, 5,000 yen above the contract price. On the Kansai Commodities Exchange, the futures contract on "Koshihikari" grown in the Hokuriku region (considered better quality than Kanto's) settled at 19,210 yen for 2011 January delivery, according to Nikkei. In the physical rice market, the old rice from last year is fetching a huge premium for the same reason - radiation contamination scare. People are afraid that this year's crop may be contaminated with radioactive cesium and a host of other nuclides that the government hasn't tested. I had told my friends and family members to buy old rice before it was news, and this time they listened. Gold (spot) hit the record high of $1,703.50 (from kitco.com). In Europe, FTSE futures down 99. There was a report of riots in London. While I was busy reporting the end of the world as the Japanese knew it, the world as the rest of the world had known ever since October 2008 was slowly getting unhinged, and now it is visibly, acceleratingly, irreversibly unhinged. The US Federal Reserve will hold the FOMC meeting on Tuesday and Wednesday, and some analysts think the Fed has no choice but declare QE3 (and 4, 5, 6, .....n), mostly because there's not much else they could do. Why they should do anything is another question, but the justification for carrying out QE2 (from November 2010 to June 2011) was to give the US government "a break" so that the government has time to shape up and do something about the economy that was decelerating. Of course nothing happened. The PPT and the NY Fed have a work cut out for them before the US market opens. The pumps failed, and TEPCO doesn't know why. Some of the pumps for Kurion's system stopped, and couldn't be restarted. One of the pumps in Areva's system that feed chemicals stopped, and the backup pump didn't work. The entire system is down. The contaminated water treatment system at Fukushima I Nuclear Power Plant has been unstable, but on August 7 morning, the system was stopped after the pumps stopped and the backup pump failed. About 7AM on August 7, some of the pumps that transport contaminated water in the US-made system [Kurion's] that removes radioactive cesium and other nuclides suddenly stopped, and couldn't be re-started. Then about 8AM, a pump that feeds chemicals to the water stopped in the French-made [AREVA's] system, and the backup pump also failed. The entire water treatment system has stopped. Water injection to the reactor continues with the water that have already been treated, according to TEPCO. The treatment system continues to be unstable. On August 4, a different pump stopped temporarily, and on August 5 an alarm sounded off and the system stopped. TEPCO has added a new treatment system [made by Toshiba] for more stable operation of the system, but since the water level is very close to the limit in the storage area [Central Waste Processing Facility] TEPCO has delayed the test run of the new system so that they can treat more contaminated water. TEPCO is looking into the cause of the trouble, and is trying to get the system back online quickly.